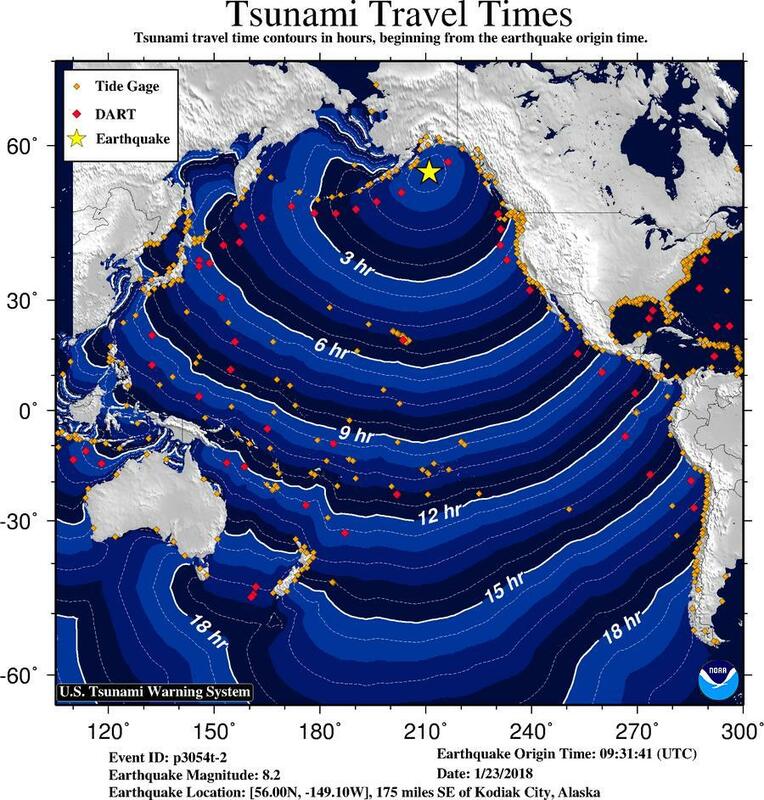 Almost the entire western coastline of the United States has been placed under a tsunami alert following a major magnitude 7.9 earthquake that struck off the coast of Alaska at around 09:30 GMT this morning. The M7.9 earthquake struck around 280km south-east of Kodiak at a relatively shallow depth initially reported as 10km, but then revised to 25km, raising fears of the potential for tsunami waves. No damage reports are available yet and being night in the affected area it is difficult to know where there is a significant threat to insurance or reinsurance interests at this time. According to the National Weather Service a buoy northeast of the quake epicenter recorded a water displacement of 10 meters, around 32 feet. A tsunami warning is in effect for British Columbia, Southeast Alaska, South Alaska and the Alaskan Peninsula and the Aleutian Islands, as well as for areas of western coastal Canada. A tsunami watch is in effect for areas further down the U.S. coastline, including California, Oregon and Washington. Authorities in Alaska have told residents to get to higher ground, but so far there are no confirmed reports or sightings of any tsunami waves. Small sea level changes have been detected by other deep-ocean tsunami detection buoys, but so far there are no reports of a tsunami hitting land. Tsunami watches for Hawaii have now been cancelled. With no reports of tsunami impacts in Alaska itself, observers are looking to British Columbia next to see whether any tsunami waves are reported. A 6″ rise in sea level was reported at Old Harbor, Kodiak, but this remains the only coastal report of a rise in levels following the earthquake. Further reports have now emerged of wave heights of up to half a foot in a number of locations in Alaska as well. Update: The tsunami watch for California, Oregon and Washington has now been cancelled. It’s not yet clear whether a tsunami has been generated, although the above buoy recordings appear to suggest a significant change in sea surface height following the earthquake. Insurance, reinsurance and ILS interests should monitor news sources for further information and we’ll update you should it be necessary.